The purpose of the training is to give you a solid base to use your skills in Biyunmetoderna and traditional Chinese medicine (TCM) to provide self-help and effectively diagnose and provide competent treatment. The program gives you several tools to diagnose imbalances and health problems as well as provide advice and treatments to improve human health. The training includes knowledge of the different traditional Chinese medical methods Biyunakademin teach . This is food as medicine, herbal Medicine, tuina medicinsk massage, Comet Stone Massage, acupressure, hand and ear diagnostics and Others. You will learn how to based on your diagnosis will advise a patient to which of Biyunmetoderna that is most appropriate for the patient and adapt advice to individual patient needs. The training includes Basic medicine knowledge as school medicine. You are given the opportunity to develop self-awareness, an ethical approach and a deeper understanding and comprehensive picture of the people. The program gives you the ability to develop good relationships with people and how to treat them to a medical professional manner. You'll learn the basics of starting your own business. This training is intended primarily for those who already has organizations in Biyunmetoderna and TKM. The program is also aimed at those who want to start own business. The program also fits those who want to help themselves, his family or friends in the best way. you master some methods of treatment according to the Biyun method. The Chinese Ministry of Health in traditional Chinese medicine requires that the program should 530 teaching hours and 70 hours clinical practice. Large parts of the course literature is in English. Some of the teaching of Chinese experts is in English. Health Advisor program is a total 600 hours. The course content consists of three parts. Of the 1 core of training consists of 300 hours of instruction and practice that are required to become a health adviser. See Appendix 1. Of the 3 comprises Biyunakademins instruktörsutbildningar. Please note that the courses you may be credited as part of health education training are listed in the Annex 3. You may count a maximum of 150 kurstimmar instruktörskurser. The contents of Biyunakademins health advisor training, total 530 teaching hours of traditional Chinese medicine and Biyunmetoderna and 70 hours clinical practice. See attachments for more information. The different modules are held by Fan Xiulan and other teachers from Biyunakademin and guest lecturers from China, experts in various areas of traditional Chinese medicine. The training given at Biyunakademins wellness center in Solna. During the training, students are given opportunities to study in China. After each module is given a written and a practical exam. China's Health Department of Traditional Chinese Medicine issued an international certificate on completion of training and pass examination. be aware of the ethical implications of their advice and treatments. 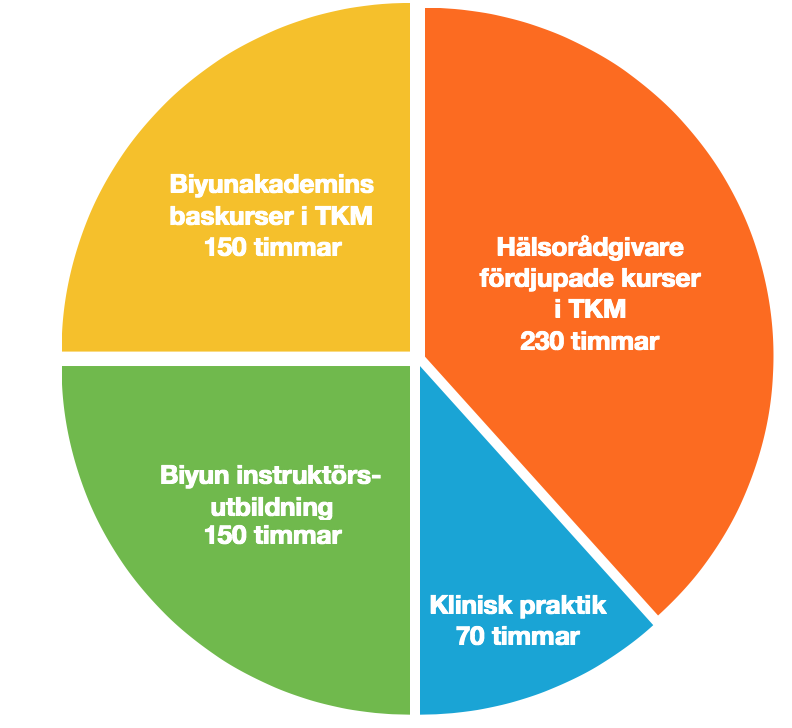 Registration for Biyunakademins education to health counselor do to: info@biyun.se. Fan Xiulan. 2004. health Tao. The long life secret. Reading Chinese health department for traditional Chinese medicine., 1. Food as Medicine, 2. Comet Stone Massage, m.fl.